Are you the HCA’s next Maker of the Year? Nominations open on 1st September 2018 for Maker of the Year, one of five prestigious awards awarded annually by the Heritage Crafts Association in recognition of people working in traditional skills. Craftspeople can also apply for, or be nominated for, HCA/Marsh Trainer of the Year, HCA/Marsh Volunteer of the Year, the HCA/Marsh Heritage Crafts ‘Made in Britain’ Award, and the HCA/Marsh Endangered Crafts Award. Each award is worth £1,000. A training bursary worth up to £2,500 is also on offer and can be used to pay for tools, materials or books as well as contributing to training costs. The bursary is offered with the support of The Arts Society. Application forms for all awards are available at http://awards.heritagecrafts.org.uk/ The deadline is 30 November 2018. The awards, which will be presented at the HCA’s Annual Conference in March 2019, recognise the amazing work done by skilled craftspeople and volunteers, and the contribution of heritage crafts to the UK economy. Basket maker Hilary Burns was awarded Maker of the Year 2018. Hilary, pictured above with HCA Patron Alex Langlands, won the award in recognition of her work on numerous projects that have put British basket making and heritage crafts at the centre of public consciousness. Hilary’s projects include ‘Baskets of the British Isles’, an installation of 52 styles of traditional British baskets hanging over the lobby bar of the Whitby Hotel in Manhattan. Steve Tomlin, Endangered Crafts Award winner 2018, with Devon maund basket. Green woodworker Steve Tomlin (right) won the HCA/Marsh Endangered Craft Award. This award recognises a practitioner of one of the 62 crafts currently listed in the ‘critically endangered’ or ‘endangered’ categories of the HCA’s Red List of Endangered Crafts. 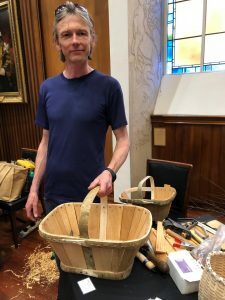 Steve, a spoon carver, ash basket maker and scything tutor used his award to learn to make Devon stave baskets (maunds), a critically endangered craft with no current practitioners or trainees. Devon-based Green Shoes was awarded the HCA/Marsh ‘Made in Britain’ Award. Started in 1981 by a group of young women passionate about making strong, beautiful, long-lasting shoes, the business has been listed in the top 15 shoemakers in the world for its ethical standards. Bookbinder Kathy Abbott was awarded HCA/Marsh Trainer of the Year 2018. Kathy currently teaches advanced level Fine-Binding in Vellum at City Lit in London as well as giving one-to-one fine-binding workshops across the UK. The Marsh Volunteer of the Year Award went to Suzy Bennett for her work creating the Dartmoor Artisan Trail. Suzy set up the trail to provide rural craft businesses with a new income from tourism, spending 18 months working on the project on a voluntary basis. Paper maker Zoe Collis won The Arts Society/HCA Heritage Crafts bursary which she is using to continue her paper making apprenticeship at Two Rivers Paper in Somerset. The awards and bursaries have been made possible through the generous support of the HCA’s funding partners, the Marsh Christian Trust, The Arts Society and an anonymous donor. Patricia Lovett MBE, Chair of the HCA, said: ‘The heritage crafts sector in England alone contributes £4.4 billion GVA to the UK economy each year, as much as the petrochemical industry. But for many years heritage crafts have been completely ignored and are still not supported by the government. These awards are a real boost for heritage crafts and craftspeople’.